Every year on the last day of February, UFCW Canada joins workers and other labour groups around the world to recognize RSI Awareness Day. Repetitive strain injuries (RSIs) are among the most common types of workplace injury and one in 10 Canadian workers is affected. The emotional pain that accompanies the physical pain takes a psychological toll not only on the worker, but also on their co-workers, families and loved ones. 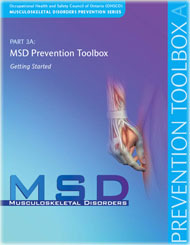 If you have ever developed a burning, aching pain while repeating the same movement for a long period of time, or shooting pains and weakness in your hands after scanning product, cutting meat, or making beds for example, you've probably experienced the early stages of repetitive stress injury (RSI). According to Statistics Canada, some two million Canadians suffer from repetitive strain injuries and more than half of these injuries are caused by work related activities. Many members working in UFCW Canada core industries are affected by RSIs. If we ignore the symptoms of RSI and they are not treated in time, they can cause a great deal of suffering, and it is important to note that if nothing is done to address the injury or remove its cause, the damage could become permanent. UFCW Canada is adamant that with adequate resources and training, many of these cases are preventable, which is why governments must adopt effective and enforced ergonomic regulations and workplace training to address RSI issues and prevention. The reality is that most repetitive strain injuries are preventable, which is why governments must support effective and enforced ergonomic regulations — which should also require workplace training to address RSI issues and prevention. To help raise awareness, the UFCW Canada Workplace Rights Committee has made available a series of RSI posters and other related tools and resources. 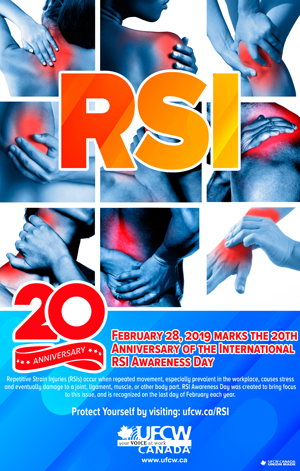 2019 RSI Awareness Day posters are now available for download in both French and English.